You're in the soup about to fly a challenging approach into an airport in mountainous territory. Turbulence is making it hard to maintain level flight attitude, much less review the approach plate information. Things are so bumpy you have to spend extra time setting the communications and navigation frequencies as your hands keep getting rattled. You persevere and tune in the ILS frequency. As you fly over the outer marker, the familiar beep-beep-beep goes of on your avionics panel--but strangely, there is no glideslope. You're a bit behind the airplane now, and you realize you forgot to positively identify the ILS using its morse code identifier. It's way too bumpy and you're way too busy to read those tiny morse code letters on your approach plate. You set your communications panel to hear NAV1 and hear a stream of dits and dahs. "Hmm, the ILS must be working--I wonder what's wrong." As it turns out, in your haste you misread the approach plate and inadvertently tuned the frequency of a VOR located on the field with the OBS set to the runway heading. You were lucky this time. Not long afterward, you recognized your error and maintained altitude until over the VOR, at which point you exercized the published missed approach. Others have not been so fortunate. Aviation history is filled with tragedies that could have been avoided had pilots positively identified NAVAIDs and other facilities. This includes both the confusing of one NAVAID with another as well as failure to recognize that a given NAVAID was out of service. ZDNet Rates PilotMorse a perfect 5 of 5! 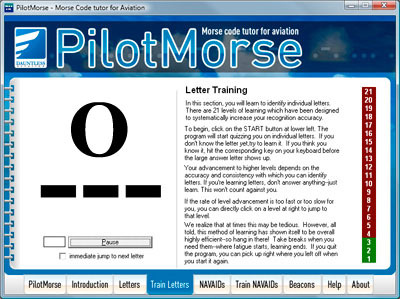 PilotMORSE is a great home solution for private pilots or aspiring professionals who want to hone their Morse code skills used to identify VORTACs, localizers, and marker beacons. Sure, you could copy down the dots and dashes during pre-flight planning, then try to find your notes while maintaining aircraft control under the hood or in the weather. It's better to be able to recognize the identifiers through proficiency in Morse. PilotMORSE takes you through the alphabet with an advanced neural network algorithm that adjusts the pace of presentation based on your responses. First you'll learn the letters, with audio and visual or audio alone. Then you'll practice with actual station identifiers using multiple choice or fill the blanks. Throughout your training, you'll get aviation-oriented background information on tuning and identifying navaids. 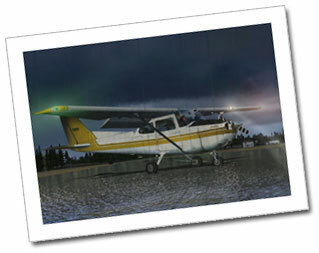 The goal is to make you a safer, more complete, and better trained pilot. "It took some work, but after only a few hours with this program, I was able to identify NAVAIDs in the air without having to look down at my charts. I highly recommend this to any pilot who wants to add that extra margin of safety to his flying skills." PilotMORSE is intended to give pilots the ability to identify NAVAIDs solely by listening to their morse code identifiers. Using an advanced neural network algorithm that monitors your learning and adjusts pace of presentation to you specifically, this program teaches you first individual letters of morse code and then NAVAID identifiers. The focus is not on turning you into a ham radio operator--this program is very deliberately structured for aviation use and to teach you this skill in a short time period. The goal is to make you a safer, more complete, and well-rounded pilot. 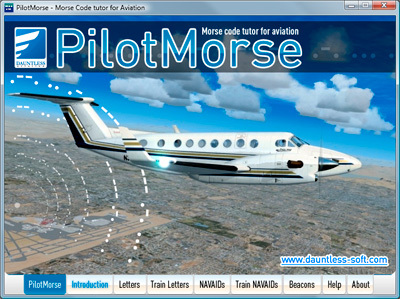 You can download PilotMorse - FREE - right now, and give it a try! Not Instrument Rated? While instrument rated pilots need to identify NAVAIDs more often than VFR-only pilots, learning to hear morse code is a skill that will nevertheless serve you well in many flying situations. Again, it's about becoming a well-rounded pilot. 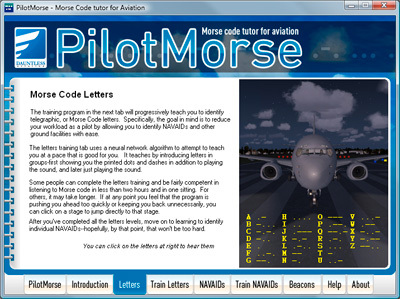 You may download PilotMORSE above. If you choose to register it, the cost is quite reasonable and the benefits substantial. 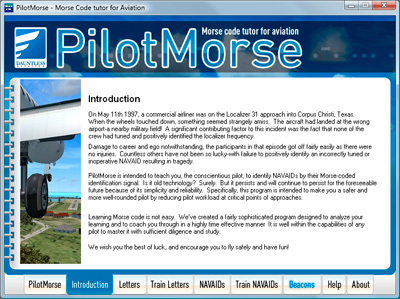 Challenge yourself by giving PilotMorse a try. Ready to purchase? Click on one of the two "buy now" links below. The best value can be had by getting PilotMorse FREE with purchase of our Five by Five FCC written test prep software (which can prepare you for both Amateur / Ham Radio tests and also Commercial / Professional tests. Do be sure you check it out! Click the above button to buy PilotMorse now for only $20. After purchase, an unlock code will arrive in your email within moments, allowing you to access the software without restrictions of the demo version above. Click the above button to visit the homepage of Five by Five, our FCC written test prep software (Ham Radio and Professional / Commercial tests). You can get PilotMorse FREE with any Five by Five purchase. 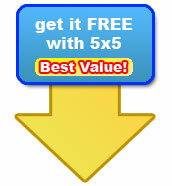 Since Five by Five is as inexpensive as $30, this can be a great deal indeed. Just click the RIGHT "Buy it now" link above or click here.